Aside from being a well-known Ridgefield businessman of his era, Edward H. Smith had two unusual and noteworthy characteristics: He was an impassioned orator against slavery and he died on the same day as his wife. Although a native of Westport, Edward H. Smith was a descendant of one of the founders of Ridgefield. He was born in 1827 and grew up in New York City and in Wilton. When he was 17, he went to Mobile, Ala., to be a clerk in the store of a clothing manufacturer who was a relative. He was there for five years, and witnessed slavery for the first time; he never forgot the scenes and the pain he saw. In 1848, he returned to Wilton but moved to Ridgefield a year later to work as a clerk. He soon started a general store on Main Street, something that was then called a “mercantile,” and owned the business for more than 40 years. He also became a partner with D. Smith Sholes in operating the Ridgefield Shirt factory. During the Civil War, Smith served as a first lieutenant in the Connecticut National Guard — by then he was probably too old to be on the battlefields of the war. He was, however, a strong believer in the cause of the Union. Excerpts from his speech were included in an 1899 biographical history of Fairfield County. “A little over a quarter of a century ago,” Smith told Ridgefielders, “there were over three million men, women and children, slaves in this Christian land of ours; men who had no rights to the fruits of their labor and toil; men without a right, without a hope, sold at the auction block like so many articles of merchandise; wives separated from their husbands, children from their parents — lovely girls, as fair in face and form as any within this hall today, bought and sold as young cattle in the streets. 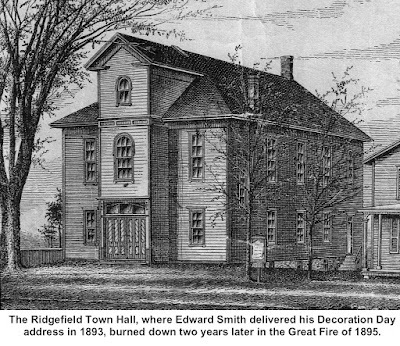 Edward Smith was active in the civic and social life of Ridgefield. He served as a state representative in 1859 as a Republican and in 1873 as what was called a “Liberal Republican.” He was a member of the Board of Selectmen, president of the Ridgefield Agricultural Society, and head of the Ridgefield Improvement Society. He was active in the Masons and St. Stephen’s Church where he was a warden and the parish treasurer. But it was in his departure from this world that he gained his final distinction. In February and March of 1905, an outbreak of “La Grippe” — as the flu was called — occurred in Ridgefield and at least five people died from it. Both Edward and his wife, Delia Gregory Smith, came down with La Grippe and both developed pneumonia because of it. They died on Feb. 24, 1905. He was 77 and she, 76. They had been married for 56 years.